Right around this time every year, click people start scouring around for new zucchini recipes to get through what is usually an abundance of summer squash. Zucchini muffins, zucchini bread, ratatouille and zucchini pasta abound. Fortunately for me, I love the stuff and can’t get enough. One of my favorite preparations is on the grill. Marinated and grilled summer vegetables are so good in pasta, salad or as a simple side. This time, I sliced some zucchini and yellow squash very thin, sprinkled with salt and pepper and quick-grilled them. Stacked with fat tomato slices and topped with a thick hunk of fresh mozzarella cheese, they made a very delicious and very pretty caprese salad. But what really made it special was the good olive oil and and balsamic reduction I drizzled over the top. I’d never made a balsamic reduction and was pleasantly pleased by how utterly delicious and simple it was. I just simmered some aged balsamic vinegar in a little pot for awhile and it became an intense, slightly sweet syrup that’s insanely good with vegetables and creamy mozzarella. A beautiful appetizer and an even better sandwich squished into a fresh baguette. Yum, yum and yum! Start by making your reduction. Add the balsamic to a small saucepan and bring to a bubbling simmer over medium-low heat. If your stove is too hot, the balsamic will boil over or burn. Once it starts bubbling, let it simmer for 20 – 30 minutes, or until it coats the back of a spoon and reduces in volume. Set aside and let cool. Note: You probably won’t use all of this in your caprese, but store it in a jar in your fridge. Since it’s vinegar, I don’t think it spoils, so there’s no expiration date. Preheat your grill or grill pan to medium-high and sprinkle your squashes with a little salt and pepper. Once the grill is hot, lay the squash on the grill for about 1 minute on each side, depending on the thickness of your squash. You want your squash tender, but not mushy and you definitely want grill lines! 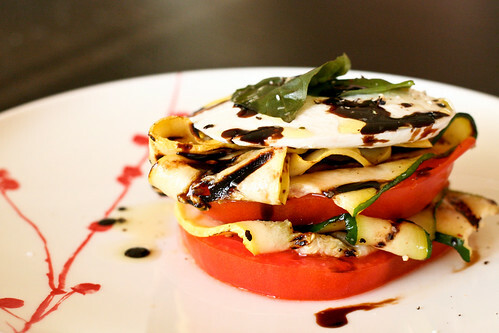 When your squash is done, make the caprese stacks. Place a slice of tomato on a plate, add a folded slice of zucchini, a folded slice of squash, then repeat: tomato, zucchini, squash. Top it all off with a slice of mozzarella and a basil leaf or two. Drizzle with olive oil and about 1 tsp. of balsamic reduction. Sprinkle with salt and pepper. Makes 4 large caprese stacks. Extraordinarily lovely styling on this one! That is summer on a plate for you alright!!!! Beautiful salad!!! How beautiful! I am just the hugest fan of balsamic reductions…particularly on asparagus but I imagine it would be fabulous on this as well. Such a pretty pic! It sounds wonderful.